The specific special issue about the beauty of the winter woods and the life of its inhabitants. Not recommended for children (there are scenes of killing and eating prey predators). Panorama taiga on mountain slopes. Spruce, the branches covered with snow. The branches of trees in the snow. Under the tree is sitting trot. Hare runs between the trees. It runs through the snow fox. Among the trees goes moose. White-tailed deer in the meadow. 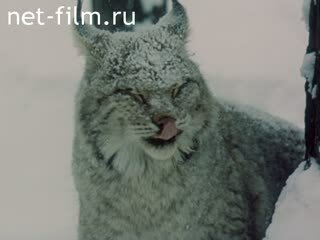 Alternation: bobcat on the trail, the trees run wild boars. Alternation of wolves surrounded the boar, civet peeps out of the hole, burrow to lay three-toed woodpecker. The wolves tearing the prey. Hare runs under the trees. Wolves in the woods mouse. A female white-tailed deer is on the belly in the snow. Wolf prowls through the woods. Alternation: natural scenery, melting icicles. Raindrops are falling in a puddle. Bear on the river bank. River view from the hill. View of the river from the shore.